A strong mix between the classic way of mounting and a modern feel. A strong mix between the classic way of mounting and a modern look. Attached on the RACK as ONE. Customization: HIGO Cable Connection or Cable Connection. Seven super bright LED distribute light evenly. BENEX light exudes European style, simplicity and functionality, which adds a unique artistic and personality to the BENEX E-Bike light collection. The main features of this rear light are the very compact size. You're also visible from the side-- The cyclist is not only seen from behind, but also from the side to crossing traffic. Unique optical design provides ultra brightness and efficiency. 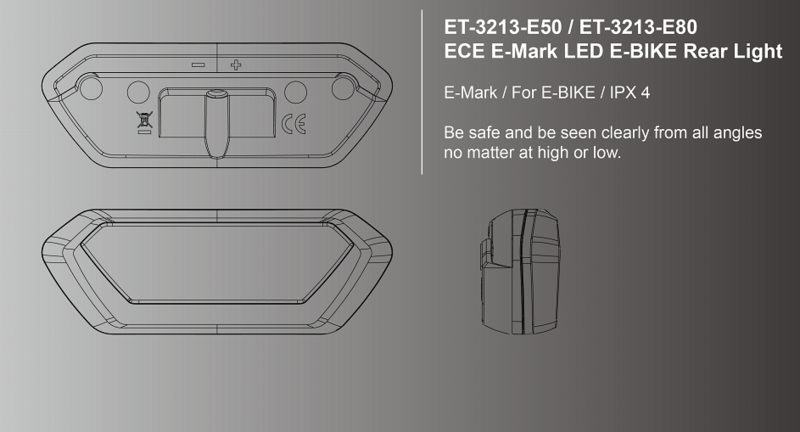 Safety-- Meets E-Mark ( ECE) regulation. Integrated reflector-- With a reflector, provides the utmost safety. The reflector passed regulation. Light, unique, compact, original, safety. 220° wide range to be seen. No dead angles. Compatible with DC 5-6V E-bike battery.